I am often asked if I utilize the methods I teach here on ModernGraham, and the answer is yes. I fully believe that Benjamin Graham’s methodology can be used in the market today, especially after taking time to analyze each one of his ideas and modernize it as needed. The ModernGraham method can be a great way to narrow down investment opportunities to the strongest companies, and then a little bit of further research can help one determine in which companies to invest. 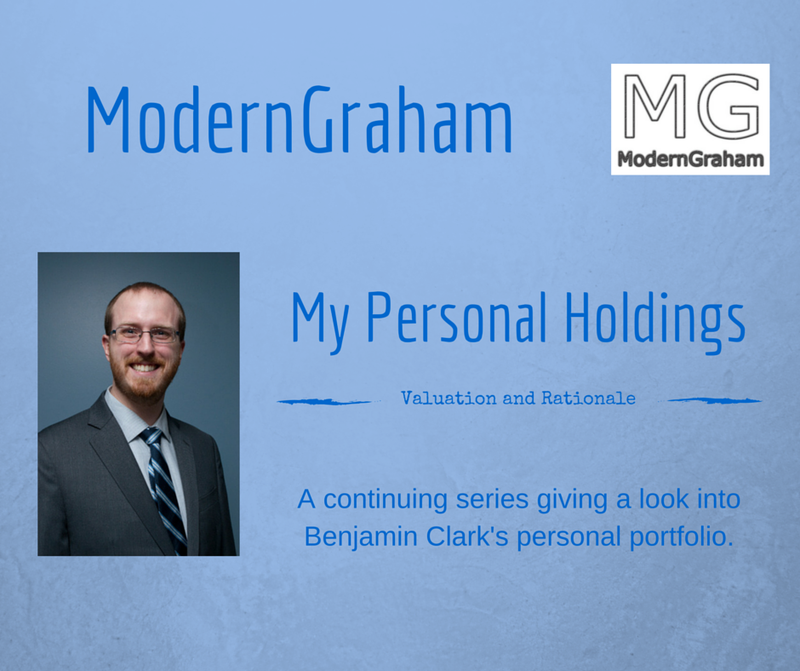 This series of posts looks at each of my personal holdings, putting them through a full ModernGraham valuation and adding a level of further research to provide rationale as to why I selected the company for my portfolio. Overall, the goal of this portfolio is to provide long-term growth to maximize retirement savings for my wife and me. With that in mind, I strive to select companies that I believe will: (1) meet the ModernGraham requirements for the Enterprising Investor; (2) be rated as undervalued by the ModernGraham valuation model; and (3) qualitatively appear to have a long-term business strategy that will generate steady results for an extended period of time. Once I have purchased a company, I tend to hold onto it even if it fails to meet those requirements in order to minimize taxes and transaction costs. With regard to allocations, Benjamin Graham taught that intelligent investors should aim to have portfolios invested 50% in equities and 50% in bonds during a normal market time, and adjust those percentages according to the individual investor’s situation and sentiment regarding the market as a whole. Graham suggested the range allocable to either asset type should be 25-75% of the full portfolio. At this time I believe the market is overvalued. As a result, my equities holdings currently total more than 50% but less than 75% of the total portfolio while my contributions and dividends are currently being applied to the bond funds. Out of concerns for diversification, I aim to limit each equity holding to 10% of the portfolio with no more than 20% allocated to any particular industry. Tapestry Inc is suitable for the Enterprising Investor but not the more conservative Defensive Investor. The Defensive Investor is concerned with the insufficient earnings growth over the last ten years, and the high PB ratio. The Enterprising Investor is only concerned with the lack of earnings growth over the last five years. As a result, all Enterprising Investors following the ModernGraham approach should feel comfortable proceeding with the analysis. As for a valuation, the company appears to be Overvalued after seeing its EPSmg (normalized earnings) decline from $2.61 in 2015 to an estimated $1.95 for 2019. This level of demonstrated earnings growth does not support the market’s implied estimate of 4.42% annual earnings growth over the next 7-10 years. As a result, the ModernGraham valuation model, based on the Benjamin Graham value investing formula, returns an estimate of intrinsic value below the price. At the time of valuation, further research into Tapestry Inc revealed the company was trading above its Graham Number of $25.42. The company pays a dividend of $1.35 per share, for a yield of 4%, putting it among the best dividend paying stocks today. Its PEmg (price over earnings per share – ModernGraham) was 17.34, which was below the industry average of 27.33, which by some methods of valuation makes it one of the most undervalued stocks in its industry. Finally, the company was trading above its Net Current Asset Value (NCAV) of $-3.17. Tapestry Inc receives an average overall rating in the ModernGraham grading system, scoring a C+. Deere & Company is suitable for the Enterprising Investor but not the more conservative Defensive Investor. The Defensive Investor is concerned with the low current ratio, high PB ratio. The Enterprising Investor is only concerned with the level of debt relative to the net current assets. As a result, all Enterprising Investors following the ModernGraham approach should feel comfortable proceeding with the analysis. As for a valuation, the company appears to be Overvalued after growing its EPSmg (normalized earnings) from $7.5 in 2015 to an estimated $8.01 for 2019. This level of demonstrated earnings growth does not support the market’s implied estimate of 5.63% annual earnings growth over the next 7-10 years. As a result, the ModernGraham valuation model, based on the Benjamin Graham value investing formula, returns an estimate of intrinsic value below the price. At the time of valuation, further research into Deere & Company revealed the company was trading above its Graham Number of $93.83. The company pays a dividend of $2.58 per share, for a yield of 1.6% Its PEmg (price over earnings per share – ModernGraham) was 19.76, which was below the industry average of 23.62, which by some methods of valuation makes it one of the most undervalued stocks in its industry. Finally, the company was trading above its Net Current Asset Value (NCAV) of $-39.08. Deere & Company receives an average overall rating in the ModernGraham grading system, scoring a C.
Dover Corp does not satisfy the requirements of either the Enterprising Investor or the more conservative Defensive Investor. The Defensive Investor is concerned with the low current ratio, insufficient earnings growth over the last ten years, and the high PB ratio. The Enterprising Investor has concerns regarding the level of debt relative to the current assets, and the lack of earnings growth over the last five years. As a result, all value investors following the ModernGraham approach should explore other opportunities at this time or proceed cautiously with a speculative attitude. As for a valuation, the company appears to be Overvalued after seeing its EPSmg (normalized earnings) decline from $4.83 in 2014 to an estimated $4.41 for 2018. This level of demonstrated earnings growth does not support the market’s implied estimate of 3.9% annual earnings growth over the next 7-10 years. As a result, the ModernGraham valuation model, based on the Benjamin Graham value investing formula, returns an estimate of intrinsic value below the price. At the time of valuation, further research into Dover Corp revealed the company was trading above its Graham Number of $50.79. The company pays a dividend of $1.82 per share, for a yield of 2.5%, putting it among the best dividend paying stocks today. Its PEmg (price over earnings per share – ModernGraham) was 16.29, which was below the industry average of 23.62, which by some methods of valuation makes it one of the most undervalued stocks in its industry. Finally, the company was trading above its Net Current Asset Value (NCAV) of $-21.78. Dover Corp receives an average overall rating in the ModernGraham grading system, scoring a C.
Ford Motor Company does not satisfy the requirements of either the Enterprising Investor or the more conservative Defensive Investor. The Defensive Investor is concerned with the low current ratio, insufficient earnings stability or growth over the last ten years, and the poor dividend history. The Enterprising Investor has concerns regarding the level of debt relative to the current assets, and the lack of earnings growth over the last five years. As a result, all value investors following the ModernGraham approach should explore other opportunities at this time or proceed cautiously with a speculative attitude. As for a valuation, the company appears to be Overvalued after seeing its EPSmg (normalized earnings) decline from $1.8 in 2012 to an estimated $1.59 for 2016. This level of demonstrated earnings growth does not support the market’s implied estimate of 0.41% annual earnings loss over the next 7-10 years. As a result, the ModernGraham valuation model, based on the Benjamin Graham value investing formula, returns an estimate of intrinsic value below the price. At the time of valuation, further research into Ford Motor Company revealed the company was trading below its Graham Number of $17.3. The company pays a dividend of $0.6 per share, for a yield of 4.9%, putting it among the best dividend paying stocks today. Its PEmg (price over earnings per share – ModernGraham) was 7.68, which was below the industry average of 17.79, which by some methods of valuation makes it one of the most undervalued stocks in its industry. Finally, the company was trading above its Net Current Asset Value (NCAV) of $-24.99. As for a valuation, the company appears to be Undervalued after growing its EPSmg (normalized earnings) from $1.3 in 2012 to an estimated $2.15 for 2016. This level of demonstrated earnings growth outpaces the market’s implied estimate of 2.37% annual earnings growth over the next 7-10 years. As a result, the ModernGraham valuation model, based on Benjamin Graham’s formula, returns an estimate of intrinsic value above the price. At the time of valuation, further research into Tesoro Corporation revealed the company was trading above its Graham Number of $75.72. The company pays a dividend of $2.05 per share, for a yield of 2.5%, putting it among the best dividend paying stocks today. Its PEmg (price over earnings per share – ModernGraham) was 11.67, which was below the industry average of 69.19, which by some methods of valuation makes it one of the most undervalued stocks in its industry. Finally, the company was trading above its Net Current Asset Value (NCAV) of $-62.03. Western Digital Corp does not satisfy the requirements of either the Enterprising Investor or the more conservative Defensive Investor. The Defensive Investor is concerned with the insufficient earnings growth over the last ten years, and the poor dividend history. The Enterprising Investor has concerns regarding the level of debt relative to the net current assets, and the lack of earnings growth over the last five years. As a result, all value investors following the ModernGraham approach should explore other opportunities at this time or proceed cautiously with a speculative attitude. As for a valuation, the company appears to be Overvalued after seeing its EPSmg (normalized earnings) decline from $4.63 in 2013 to an estimated $3.79 for 2017. This level of demonstrated earnings growth does not support the market’s implied estimate of 5.63% annual earnings growth over the next 7-10 years. As a result, the ModernGraham valuation model, based on the Benjamin Graham value investing formula, returns an estimate of intrinsic value below the price. At the time of valuation, further research into Western Digital Corp revealed the company was trading above its Graham Number of $53.68. The company pays a dividend of $2 per share, for a yield of 2.7%, putting it among the best dividend paying stocks today. Its PEmg (price over earnings per share – ModernGraham) was 19.75, which was below the industry average of 28.12, which by some methods of valuation makes it one of the most undervalued stocks in its industry. Finally, the company was trading above its Net Current Asset Value (NCAV) of $-29.38. At the time of valuation, further research into WestRock Co revealed the company was trading below its Graham Number of $48.57. The company pays a dividend of $1.45 per share, for a yield of 3.3%, putting it among the best dividend paying stocks today. Its PEmg (price over earnings per share – ModernGraham) was 14.46, which was below the industry average of 53.08, which by some methods of valuation makes it one of the most undervalued stocks in its industry. Finally, the company was trading above its Net Current Asset Value (NCAV) of $-38.4. No individual valuation completed – yet. Berkshire Hathaway Inc. is not suitable for the more conservative Defensive Investor or the Enterprising Investor. Both investor types are turned off by the lack of dividends. As a result, all value investors following the ModernGraham approach based on Benjamin Graham’s methods should proceed only with a cautious and speculative attitude. As for a valuation, the company appears to be undervalued after growing its EPSmg (normalized earnings) from $4.15 in 2011 to an estimated $7.22 for 2015. This level of demonstrated earnings growth outpaces the market’s implied estimate of 5.52% annual earnings growth over the next 7-10 years. As a result, the ModernGraham valuation model, based on Benjamin Graham’s formula, returns an estimate of intrinsic value above the price. As for a valuation, the company appears to be Undervalued after growing its EPSmg (normalized earnings) from $3.42 in 2014 to an estimated $5.6 for 2018. This level of demonstrated earnings growth outpaces the market’s implied estimate of 5.56% annual earnings growth over the next 7-10 years. As a result, the ModernGraham valuation model, based on the Benjamin Graham value investing formula, returns an estimate of intrinsic value above the price. At the time of valuation, further research into Walt Disney Co revealed the company was trading above its Graham Number of $60.93. The company pays a dividend of $1.56 per share, for a yield of 1.4% Its PEmg (price over earnings per share – ModernGraham) was 19.62, which was below the industry average of 52.62, which by some methods of valuation makes it one of the most undervalued stocks in its industry. Finally, the company was trading above its Net Current Asset Value (NCAV) of $-24.44.